Ok, technically, these are not “street” foods because they all have a brick and mortar setting, but they come pretty close. The term street food has recently become a trend here in Greece, from Street Food Festivals to small spots opening around the city, people are searching for cheap, fast, but good quality meals. I’ve had my share of street food here in Thessaloniki and came up with a list of 5 of my favorite spots. Be sure to check them out if you are ever visiting Thessaloniki, or if you live here and have never heard of them! Although there are several Italian pizzerias in Thessaloniki that all serve top-notch pizza, The Last Slice is definitely the best one. Conveniently, located near Aristotelous Square, this pizza joint is in an easy to reach spot. The pizzas are freshly made daily, with plenty of pizzas coming out of the oven throughout the day – every 7 minutes to be exact. Whether you are out shopping and need a bite to eat, or went out for a drink and have a hard case of the munchies, The Last Slice will not disappoint. My personal favorites include any with prosciutto on top, but be sure to check out many of their other delicious and unique flavored pizzas. For all my vegan and vegetarian friends out there, you have to check out GARBANZO – in fact, everyone should! It’s about time we start eating some healthy street food. GARBANZO only opened a year and a half ago, but I have a feeling they’ll be sticking around for a while. The folks over at GARBANZO commit to a 99.9% vegan menu, all made with fresh ingredients. They specialize in DYI falafels where you can add any salads and veggies to your falafel sandwich yourself. 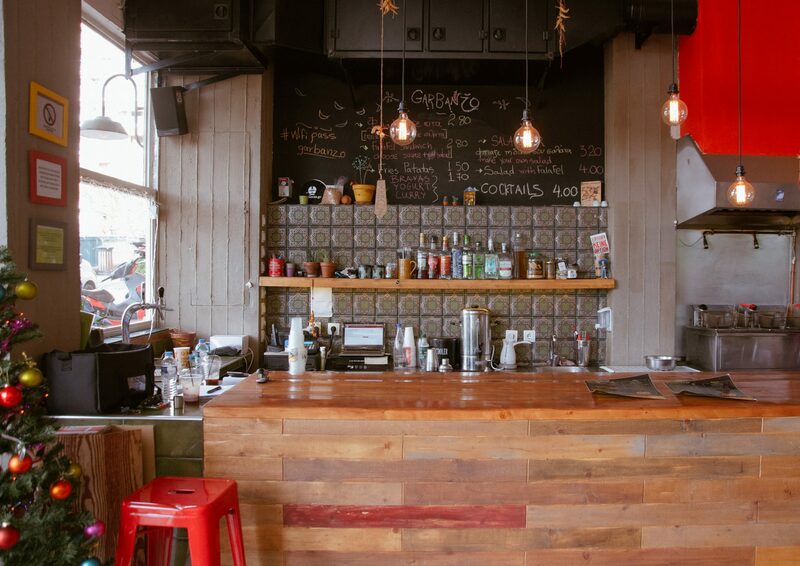 Their wooden interior design coupled with colorful flags and tiles, creates a nice ethic vibe inside and out. Want a drink to accompany your meal, or just in the mood for a drink, then be sure to also try out their mojitos, where you’ll be pleased to find out you can also order them to go. The literal translation of Το Βραστό Ψήνεται means, “the boiled gets grilled”. There is nothing fancy about this little joint, they’re not even on social media; nonetheless it is a favorite among the locals. With a fixed price, you can make your own sandwich, with your choice of meat, veggies, sauce and seasoning. Do not underestimate the appearance of this simple spot because their food is delicious! The key to their tasty meats is that they boil them first and right when you order, they beginning grilling them, savoring all their tasty juices for you to enjoy. I’ve never been to France, but something tells me that Greek crepes are way better than the French ones. Is it because we love to stuff them with as many ingredients as possible? Or is it because whether they are filled with something sweet like nutella or something salty, they are always mouthwatering delicious? Either way, Creperie Souzet always delivers. Located on the ever so packed Zeuksidos Street, where the cafes as well as the main square, are always packed with people drinking and having a good time, Creperie Souzet is a perfect spot to grab something to fulfill your crepe craving. Last but not least, I could not make a list of street food in Thessaloniki without mentioning, Nterlikatesen, one of the best souvlaki spots in town. Nterlikatesen grills hundreds of souvlaki a day. Order a few souvlaki, some baked potato, and a Greek beer and thank me later! This is as Greek as street food gets. You can read more about my favorite spots here!